My family and I have just returned from spending a week in Morocco - we went over the February half term to Marrakech and loved it. We stayed outside of Marrakech in a Boutique Hotel/ House called Casa Taos that we found via i-escape.com. We decided that staying out of town would give us the the best of both - space for the kids to run around, peace and quiet and fresh air but at the same time we were able to dip into the action in Marrakech town which was only a 20 min taxi ride away. Casa Taos was perfect - it is family owned guest house with bedrooms around a courtyard in the main building as well as a 2 bedroom, 2 bathroom house in the garden - where we stayed. There is a swimming pool, palm trees, hammocks, citrus trees, a tree house for the kids to play in and lots of different areas in the stunning garden to sit and relax. The home cooked and often home grown food was delicious - it was mostly traditional Moroccan food and included dishes like lamb tagine, vegetable couscous, hummus and freshly baked bread. They also had a children's and lunch menu which all changed daily. YSL Museum + Jardin Majorelle - I loved the YSL Museum, the architecture was stunning and being a fashion lover the subject was interesting too. We also went to the Jardin Majorelle which is right next door to the museum and is full of colours and cactus. Nomad + La Jardin Restaurant - these were both restaurants that were recommended to us before we went and they did not disappoint. Nomad's food was delicious (and included a great kids menu), we sat on the roof and enjoyed the views of the Souks. La Jardin is a great place if you want a rest from the bustle of the town. It is set in a green, tropical courtyard with different terraces and a couple of tortoises wondering around. 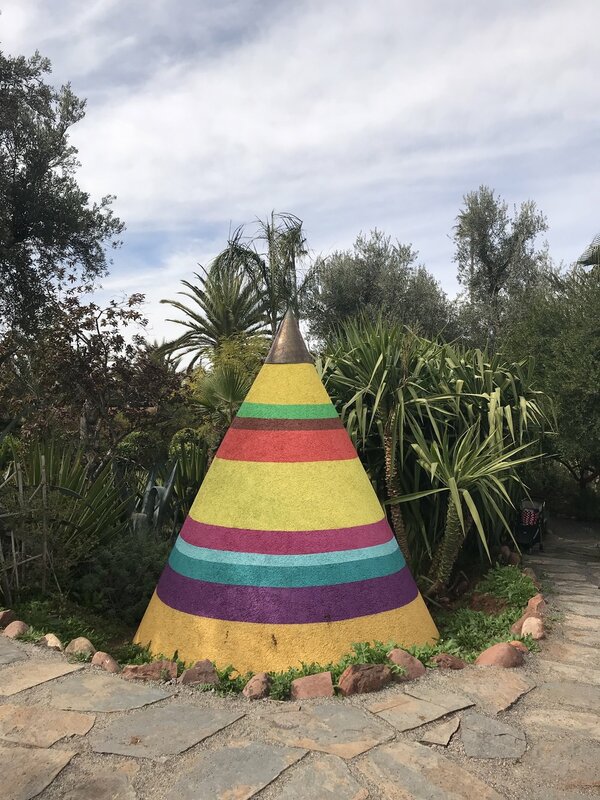 Anima Gardens is about a 40 minute drive from the main square (where the free bus runs too and from) The garden was stunning, so colourful and creative and all set to a backdrop of the Atlas Mountains. We had lunch at the cafe and the kids ran around and played hide and seek amongst the sculptures. Shopping in the Souks - We headed into the Souks a few times while we were in Marrakech - they are amazing. We all found it fascinating - the kids were captivated by the bussel and energy of the place and I couldn't get over how much buying and selling there was. We didn't go crazy with the shopping although I did manage to come home with a couple of baskets and wooden snakes for the kids. The weather - the week before we arrived they had had rain all week but when we arrived the sun came out. The evenings were cold but it was hot (average 20 degrees) when the sun was out. Kids - our kids (aged 5.5 and 3.5 years old) loved it, there was so much to see. There was a fair amount of walking so we took a buggy which they both went in at times. We went out for an early dinner one evening and although it was great to enjoy the evening atmosphere we had to keep a close eye on the children as I could see how easy it would be to loose one! This post was in exchange / partnership with i-escape.com who provided part of accomodation in return for an honest review of our stay.